Good afternoon, friends! I hope you're having a lovely weekend. 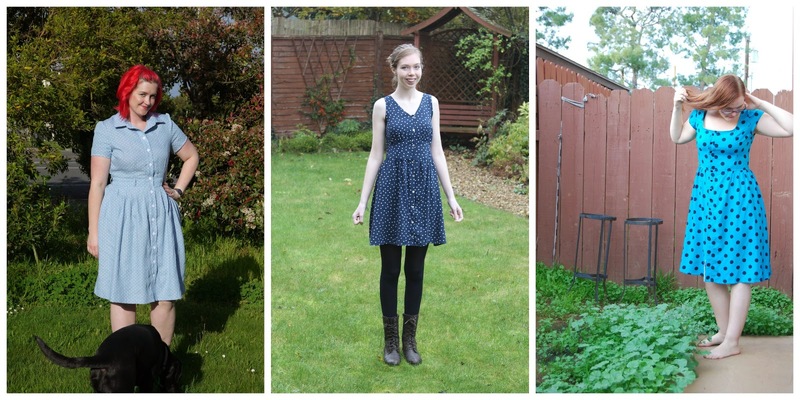 My own has been spent perusing the gorgeous entries into the Autumn of 1000 Shirtdresses! 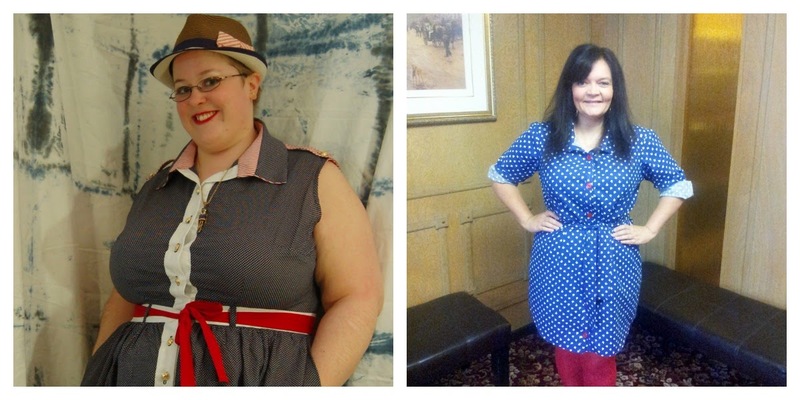 Y'all, we ended up having forty-seven shirtdressess made over the last few months. That's a whole lot of buttons! 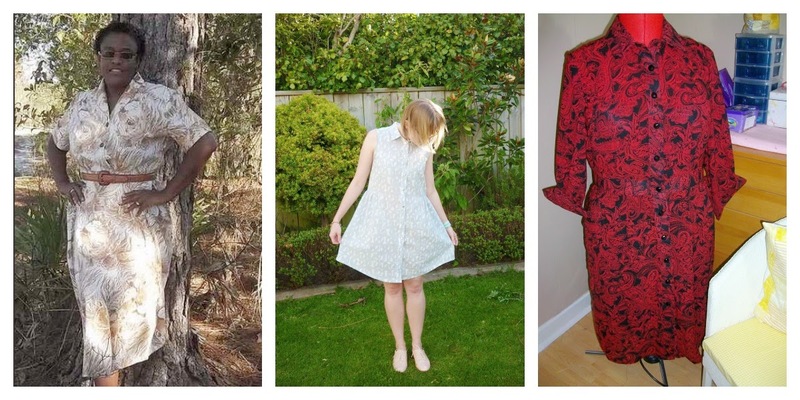 I've gathered up the official entries below, so that we can all properly gawk at these beautiful garments. Shall we? Sophie-Lee looks ethereal in her light blue polka dot chambray dress, Lauren drafted (!) 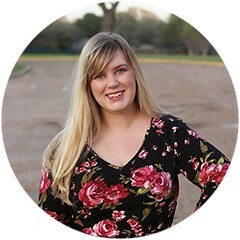 her own classic, navy blue dotty shirtdress, and Nicole opted for a chic collarless shirtdress, in this super fun polka dotted rayon. 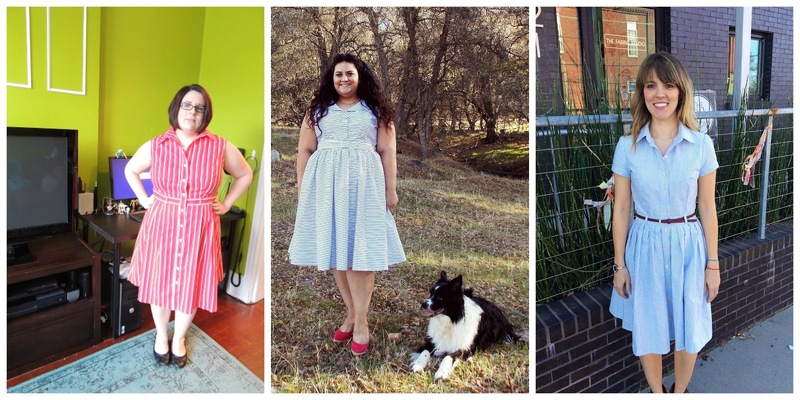 Andie is a woman after my own heart in this seasonally-inappropriate nautical shirtdress, with white bands and striped shoulder button tabs, while Beat Girl not only made a shirtdress, but her first ever dress! Even cooler, those dots are actually tiny daisies, when up close. 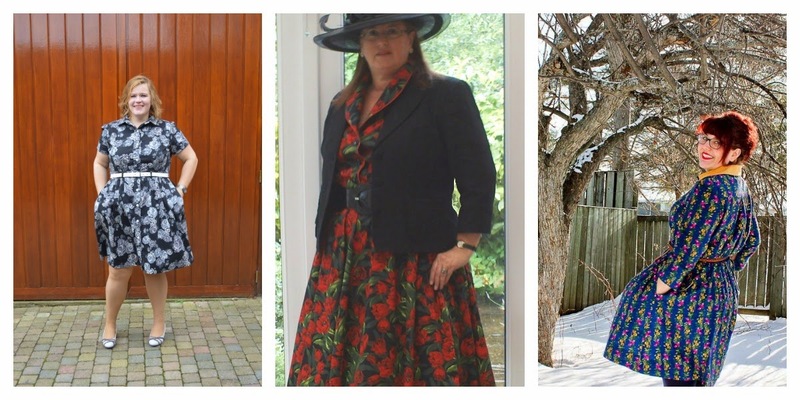 Marije was our very first entrant, with this gorgeous black-and-white version of McCall's 6696, Caroline is a vision in this vintage-inspired red floral, with a beautifully piped collar, and Chrystal has me swooning over her floral striped shirtdress, with a coordinated yellow collar. 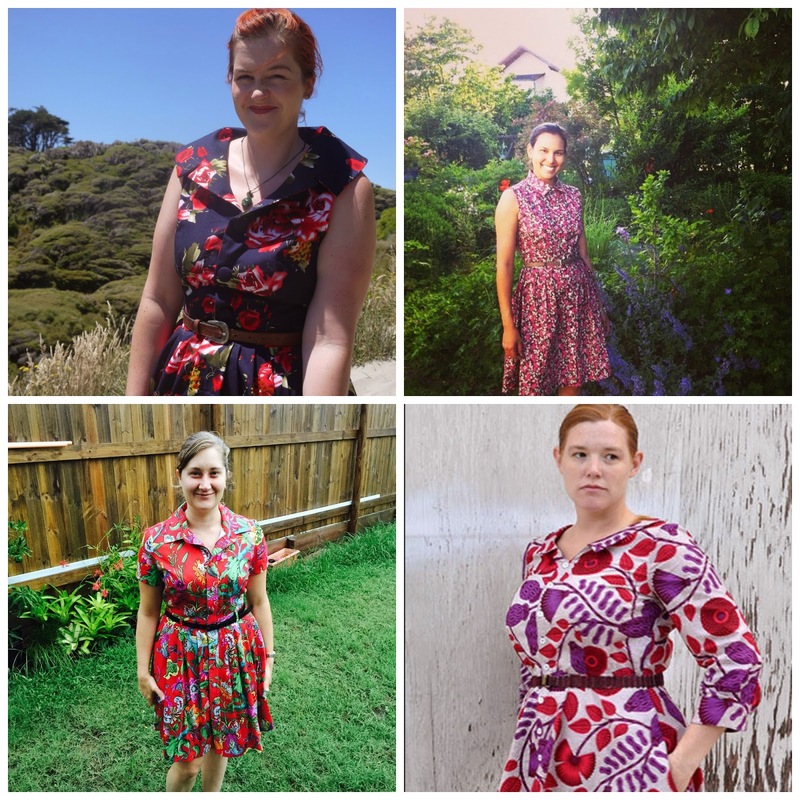 Sophie-Lee went with vintage re-issue Simplicity 1459 for her second fabulous shirtdress, made up in a largescale floral cotton sateen, Bianca is right at home in a garden, wearing her lovely raspberry ditsy floral, Rhiannon's dramatic red botanical print has me on the look out for copycat fabric, and Alicia is so on-trend for 2015 in this glorious wax print floral Hawthorn. 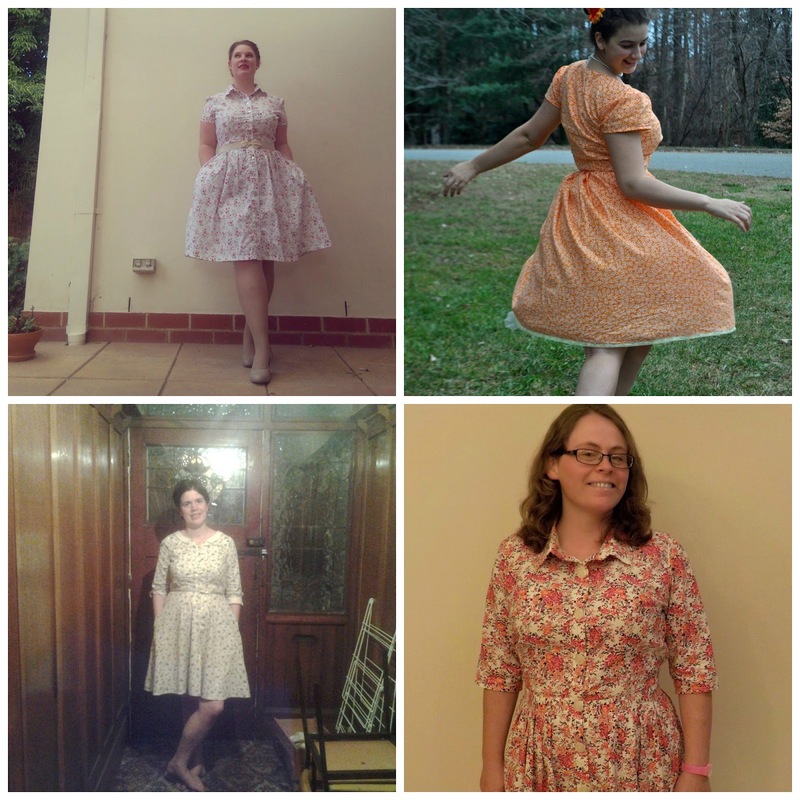 Bec is channeling the divine wardrobe of Betty Draper in her sweet floral lawn 6696, Emily put a twist on the Colette Pastille dress to create her lovely orange half-shirtdress, Rowena made a beautiful Hawthorn, using bamboo-and-bird print cotton and coordinated cream collar/cuffs, and if Izzy didn't live in Saudi Arabia, she'd be in danger of me stealing this shades-of-pink floral shirtdress from her closet! 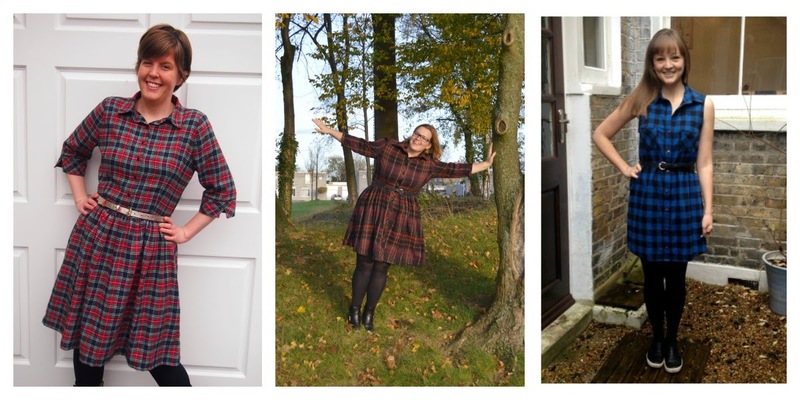 Ruth made a perfectly matched version of the Cami dress, complete with bias-cut sleeve cuffs for a fun bit of visual interest, Marije returned with a beautifully autumnal plaid for her second version of 6696, and Fiona made a cozy, layering version of the Alder dress in blue-and-black buffalo plaid flannel. 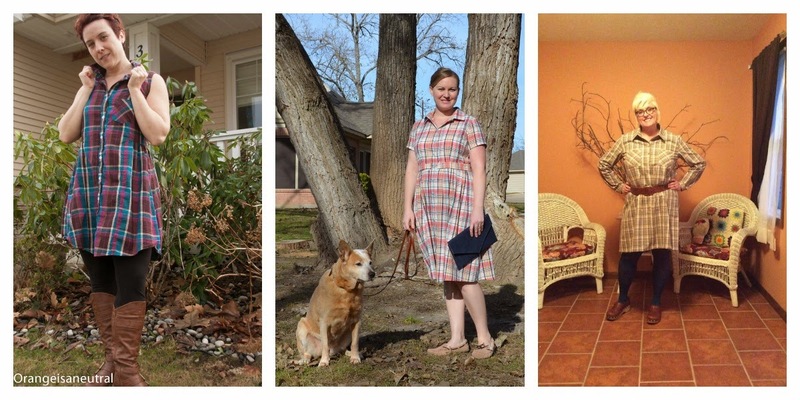 Cheryl is super cool in her plaid, sleeveless Alder and fabulous brown boots, Qui made the epitome of a classic shirtdress, in a sweet peach and turquoise plaid, while Debbie made her first ever shirtdress, a fantastic neutral plaid version of McCall's 6600. Gina is tailored and chic in her gorgeous candy-striped version of M6696, which I'm already plotting to knock off, Tanya was inspired by the period costumes of Call the Midwife, when she made her lovely navy-and-white striped vintage Simplcity, and Nancy is sweetly classic in her blue-and-white striped M6696, proof that the simplest fabrics can also be the prettiest. Honey looks so modern and lovely in her bold, graphically printed shirtdress , Melizza's silk ribbon version of the Alder dress is the perfect winter layering piece, CFA13 is absolutely gorgeous in her retro print shirtdress with coordinated buttons, while Amanda is a picture of summery cuteness in a rayon version of much-loved M6696. Angelica used a textured cotton floral, gifted from her grandmother, to make a light and beautiful Hawthorn dress, Marilla paired a southwestern print Kaufman chambray with her own Maya dress pattern, for the ultimate day dress, and Bianca is a work of art herself in a blue-and-white printed version of M6696. 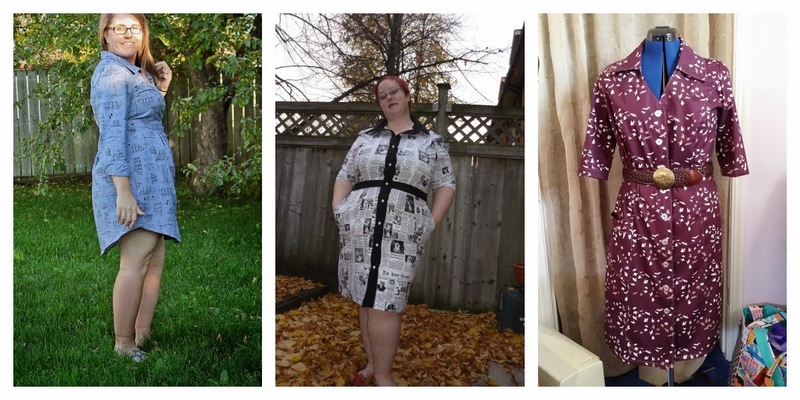 Chrystal captured that casual end-of-summer vibe in her gorgeous nautical print shirtdress , Andie stole all of our hearts with her color-blocked, cat-themed newspaper dress, while Linda put a bird on it, with this modern maroon shirtdress in the cutest flock-print fabric. Lyric is absolutely stunning in her cream-and-khaki botanical print half-shirtdress and chic belt, Kirsten used a Japanese cotton lawn to create a fresh and summery version of Grainline's Alder dress, and Trisha use French seams and heaps of hand-sewing on her elegant and bold crepe de chine shirtdress. 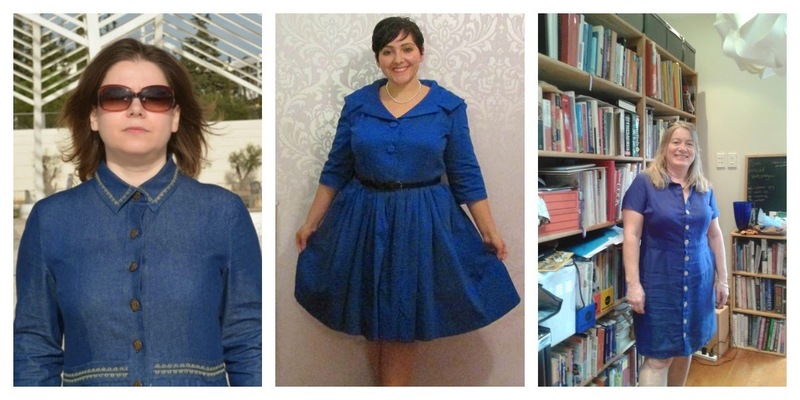 Becky started off a parade of gorgeous blue shirtdresses, with her classic denim fit-and-flare and super cute gold toe shoes, Jo is as pretty as a picture in her dark indigo Frankenpattern shirtdress, and Cheryl altered the Alder pattern, to make this casually cute chambray popover dress. 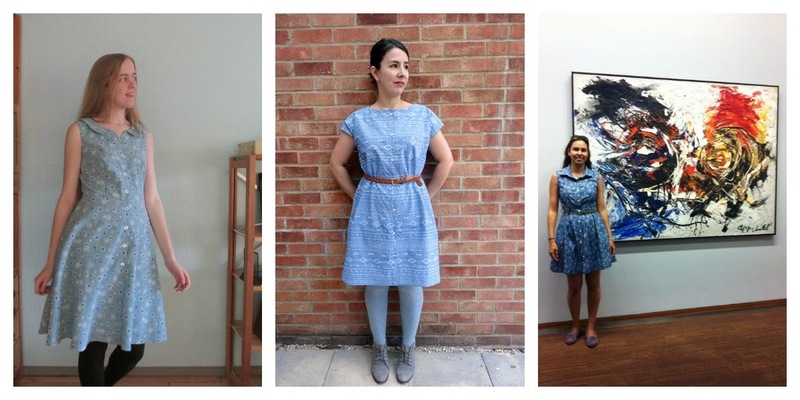 Ida Aida turned her soft denim M6696 into a stand-out dress, with an embroidered collar and waistband, Sylvie is timelessly elegant in her royal blue version of Simplicity 1459, in a tone-on-tone print cotton sateen, CFA13 makes the ideal summer dress, in blue linen with variegated cream buttons. 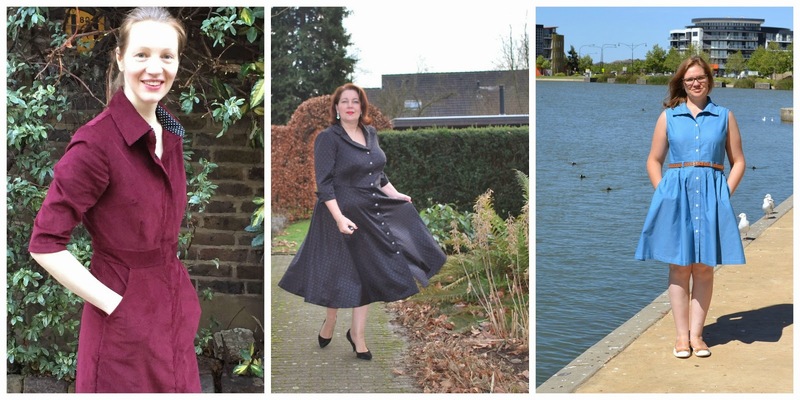 Caroline reminds us that corduroy can be elegant, in a burgundy M6696, with pops of polka dot contrast fabric, Marianne's beautiful black brocade shirtdress is perfect for a night on the town and sipping festive drinks, and Tanya is all summer elegance in her classic blue shirtdress, with white buttons and top-stitiching. Holy smokes, ladies! I'm blown away by these dresses. 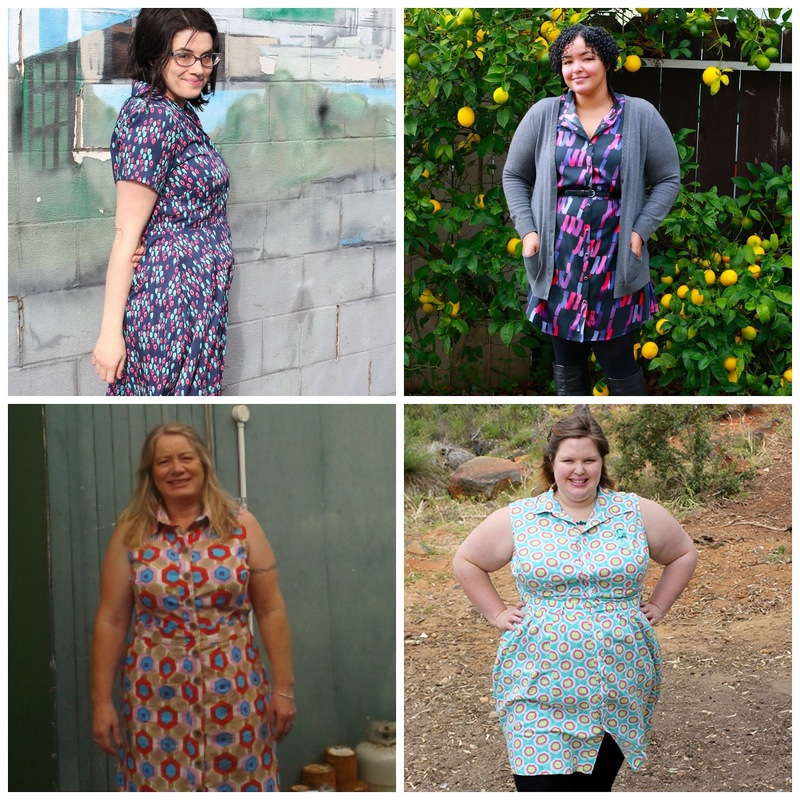 Thanks so much for joining me in this sewing challenge and braving all those buttonholes. Your dresses are, to a one, beautifully made and absolutely lovely. I know I'll be perusing that Flickr group for more inspiration, in the future! Thank you, again, for sharing your creative talents with me and the other participants. 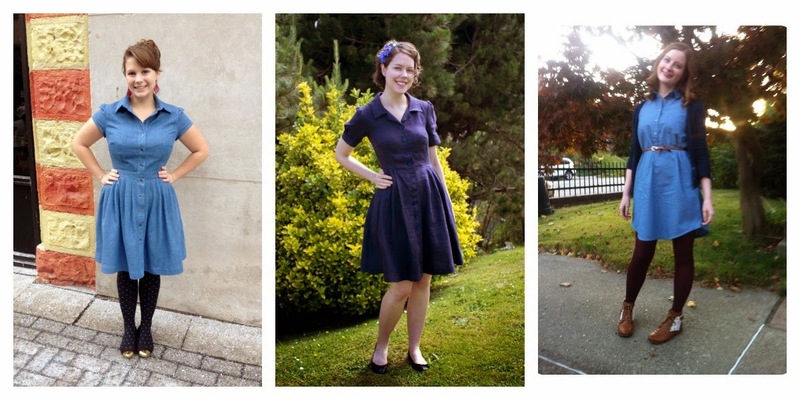 Now, onto the last question of The Autumn of 1000 Shirtdresses. 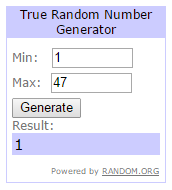 Our winner is also our very first entrant, Marije of Make Think Go! Congratulations, Marije! 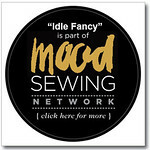 Send me an e-mail with your mailing address to anidlefancy (at) gmail.com and I'll send out your goodies!